There is a coziness about ranch weddings. Laura and Iain definitely had a intimate wedding. Their celebration was sweet and casual with a bohemian flare. We photographed their first look away from the ranch up a dirt road near a tiny cemetery. It was private and lovely. The sun peeked in and out of the clouds offering gorgeous light for the photo session. 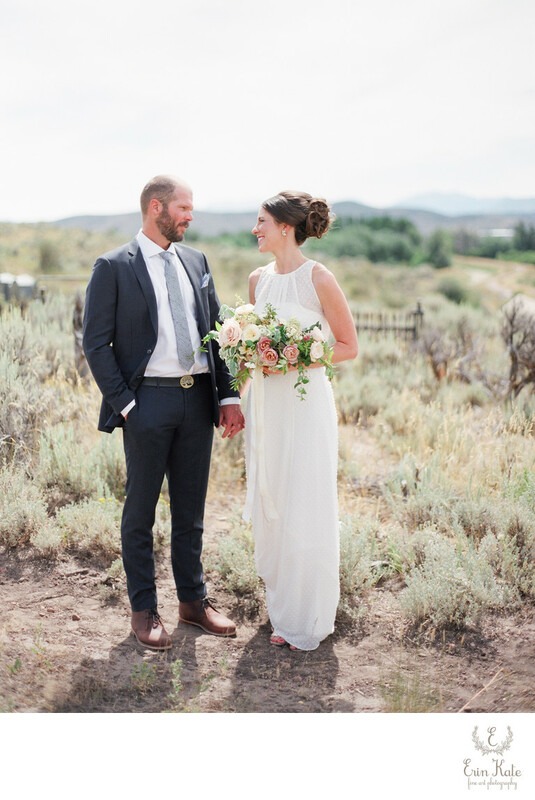 Laura's cream dress and Iain's navy suit with the sagebrush and wild pastel bouquet made for a beautiful color palette. I recommend at least 40 minutes for the bride and groom portrait session. It's then up to the couple if they want to spend more time for photos. Sometimes a venue is larger and they want to really cover the grounds and have a longer session. Sometimes they want to photograph at multiple locations so travel time is accounted for. The majority (about 90%) of my couples opt for the first look and other photos (bridal party and family) to be done before the ceremony. These sessions, when completed early, are more relaxed and enjoyable. I've never had anyone say they regret finishing all sessions before the ceremony. And a major plus...couples get to enjoy their cocktail hour with all their guests! View more of Laura and Iain's casual ranch wedding HERE.